In case of no show we will charge the 100% of the reservation to your credit card. Illuminated and ample, our hostel is a unique place in the city. The hostel is divided in 2 buildings. 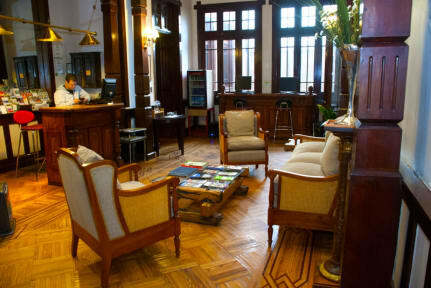 The main building is large and divided in two levels, 15 rooms with wooden floors and beautiful details. In addition, it has a terrace on the top. The second building is located right next to the main one, and has 4 superior rooms, that gives to the guest more privacy. Our location is privileged, San Antonio with Ismael Valdes Street, next to the forest park; near to the historic neighborhood of Santiago. This Allow the tourist to easily access the typical places of the city, such as: Central market, Plaza de Armas, Cerro San Cristobal, pre-Columbian Museum, Cerro Santa Lucia, Bellavista (Patio), Bellavista La Chascona (Pablo Neruda), La piojera, Centro Mall, La Moneda, Santiago Cathedral, Paseo Ahumada, Estacion Mapocho, supermarkets, banks, among others. Casaltura is a very neat hostel, with very friendly personnel and great roof terrace on a great location in Santiago. We booked a double bed private room, but got two single beds (which was not casaltura’s foult btw) and therefor got a free night in the hostel. We recommend to stay at this nice place!